This Miami born photographer practically grew up with a camera in his hand. It was the Kodak Brownie given to him as a child that did it for him. No one escaped his lens. After many photography courses. He did freelance work for a Miami Herald Photographer on the extra jobs that he couldn't cover. He had his own dark room where he processed his own film as well as prints for the Key Biscayne newspaper. When Hurricane Andrew hit in 1992 with 18" of salt water in his home all his work and camera equipment was lost. Don and his wife Anne, also his real estate business partner moved to the west coast of Florida in 1996. 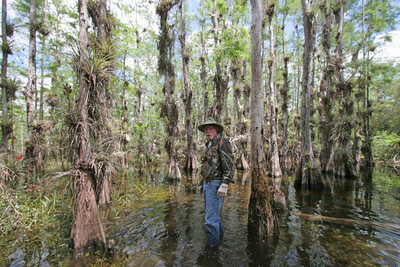 In his youth he spent a lot of his time hunting and exploring the Everglades. Now he currently spends at least one or two days a week traipsing around the swamps and prairies of the Everglades photographing everything that moves and some things that don't. He is trying to capture the hidden beauty that most never see from the highways. He has taken over 20,000 pictures in the last few years trying to preserve as images animals, plants and vistas that are quickly disappearing to "progress". "Most Wednesdays, I drive out to the Everglades, put on my snake boots and backpack, and then head out into the swamps to spend the day photographing the wildlife and landscapes that make up this rare and precious place. Some days I take hundreds of pictures and some days only a few, just taking in natures wonderment." I want to make sure my grand daughters Madeline and Lily Rose have some record of what was once there in the Everglades. Capt. Don is a licensed U.S. Coast Guard Captain and holds a Masters license. He has spent most of the last 20 years guiding fishing and birding trips in the 10,000 islands of the Everglades National Park.